We will smoothly guide you to approximately 800 allied medical institutions. Our call center staff with medical knowledge will interpret your message to the doctor. You can receive medical treatment on a cashless basis without having to pay an expensive medical treatment cost at the medical institution. ※ In some regions, we may not be able to arrange a medical institution where you can receive treatment on a cashless basis. ※ Depending on the case, costs such as a medication cost may not be covered by the cashless service. This is an example of the cost of medical treatment for your injury or iIIness during your stay in Japan. Even if you have purchased travel insurance， you may have to pay the whole medical treatment cost in advance in cash as an out-of-pocket payment depending. ※ The insurance premium varies with the insurance term. For details of the premium， visit the website. You can purchase this insurance if the travel period is 30 days or less. * You cannot purchase this insurance if the travel period exceeds 30 days. You can purchase this insurance regardless of whether the travel is for sightseeing or on business. * If the purpose of the travel is to receive medical treatment of an injury or illness or mitigate the symptoms, you cannot purchase this insurance. You can purchase this insurance for multiple persons among family and friends. * You can purchase this insurance for a maximum of 10 persons at the same time. The insurance covers a medical treatment cost or the like in cases where the customer received a doctor’s treatment in Japan for an illness*2 or injury that was suffered during the insurance term*1. * 1 The insurance term begins after six hours from the starting time of contract procedure subsequent to entry to Japan. ※２ The insurance also covers a medical treatment cost or the like in cases where the symptoms of an illness that the customer developed before visiting Japan, and for which the customer had received a doctor’s treatment, were rapidly deteriorated and the customer received a doctor’s treatment in Japan. The insurance covers the actual cost of medical treatment or the like with the upper limit of 10 million JPY. The above is an outline of the coverage. For details, see “Description of Important Matters." In case of illness or injury, you can receive medical treatment on a cashless basis at our allied medical institutions. ※ This service can be used if the policy contract is valid. In case of accident, call the Insurance Claim Call Center. The Call Center will reserve and arrange a nearby medical institution for you. Enter necessary information in the prescribed document at the medical institution, and receive medical treatment on a cashless basis. Sompo Japan Nipponkoa will pay the medical treatment cost to the medical institution. 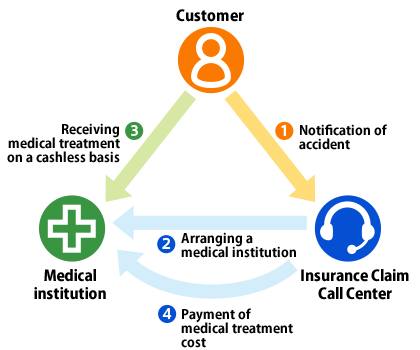 Even if you call the Call Center for Cashless Treatment,the center may not be able to arrange a medical institution where cashless medical treatment is available depending on the area. In such a case, make an out-of-pocket payment of the medical treatment cost once, and later claim the insurance benefits using the insurance claim site. At medical institutions in Japan, you may receive a prescription after medical treatment, and then need to purchase medicine at a separate pharmacy outside the medical institution. In doing so, you may need to make an out-of-pocket payment. In such a case, please pay the prescription charge to the pharmacy, and later claim the insurance benefits using the insurance claim site. If you have any question about the policy contract, use the Insurance Purchase Support Call Center where English, Chinese and Korean are available. For your insurance claim, we have a call center that is specialized for insurance claims and where English, Chinese and Korean are available. １．Can I purchase the insurance by bank account transfer? １．We are sorry, but you cannot purchase this insurance by bank account transfer. We ask you to pay the premium with a credit card. ２．Can I purchase the insurance in corporate name? ２．You cannot purchase this insurance in corporate name. We ask you to purchase the insurance in the individual name of the customer. In addition, the policyholder needs to be the holder of the credit card used for the payment. ３．The travel period exceeds 30 days. Can I purchase the insurance? ３．If the travel period exceeds 30 days, you cannot purchase this insurance. ４．After canceling the confirmation of contract contract, can I purchase the insurance again? ４．You can purchase this insurance again. Please note that the coverage will begin six hours after you purchase the insurance again.